This list of escalating fixes that can solve a surprisingly large number of iPhone 4 problems. 1. Reboot (hard reset). This may yield success for slow 3G data transfer and other issues. Hold down the sleep/wake and home buttons simultaneously for roughly 15-20 seconds, until the screen powers off then an Apple logo appears, which signifies a reboot. Some problems may require (oddly) that this procedure is performed twice. 2. Reset all settings. This may resolve proximity sensor issues, slow throughput, FaceTime problems, loss of cellular service and more. It appears that the reset may restore disengaged hardware components and clear corrupt data that prevents proper connectivity. Navigate to Settings > General > Reset > Reset All Settings. Note that this will erase stored messages, passwords and other information. Use these tips from Apple to preserve data during the procedure. some problems may require that the phone is restored while it is in DFU (device firmware upgrade) mode. Doing so may resolve issues with Exchange, an inability to send and receive MMS messages, device slowness and other problems. 1. Backup your phone and preserve data. Follow the steps in this Apple Knowledge Base article to transfer your purchases and backup your iPhone. 2. Put iPhone into DFU mode. 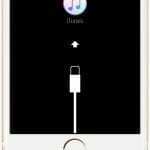 Connect your iPhone to your computer and open iTunes (if it doesn’t open automatically). Hold down both the top (sleep/wake) and home buttons for exactly 10 seconds, then release the top (sleep/wake) button but keep holding the home button until iTunes displays a message stating that a phone in recovery mode has been discovered. 3. Restore. Press the restore button and allow the phone to complete the restoration data. After it is done, select setup as a new phone. 4. 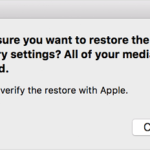 Restore your backup (optional). Next, you can restore the phone again in the normal fashion (not DFU mode) using the most recent backup rather than setting up as a new phone. However, this may cause the original problem to return in some cases. If the problem returns, follow steps 1-3 again and do not restore your backup. 4. Reseat your SIM card. This fix is effective for some data throughput, signal or cellular service issues. Simply remove your SIM card, clean it lightly using a dry cloth, ensure that there is no debris in the SIM slot, then reinsert the card, ensuring a snug fit. Instructions for doing so can be found in this Apple Knowledge Base article. 3G versus EDGE. The iPhone 4 automatically switches to EDGE from 3G when the 3G signal falls below a certain threshold. One hypothesis holds that the new signal recognition algorithm included in the iPhone 4 software update will more accurately recognize when a 3G signal is untenable, and more aggressively switch to EDGE before calls are engaged. Because calls drop when the switch from 3G to EDGE is made and EDGE coverage is significantly more vast than that of 3G, this change may result in a real-world reduction in dropped calls. As noted in our list of fixes for the reception issue, several users have experienced faster throughput via EDGE than 3G when this issue manifests. Bad calibration. Some RF antenna engineers suggest that faulty calibration of the iPhone’s signal recognition mechanism may result in unnecessarily dropped calls. In other words, the iPhone 4 may be incorrectly triggering call drops when a viable signal exists. The recalibration included with the forthcoming iOS software update may improve this situation. A software signal boost. Previous iPhone software updates have reportedly boosted signal strength by increasing power to the antenna. 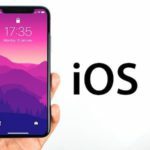 The forthcoming iOS software update may include a similar change, which would likely result in a slight degradation of battery life, but improved cell reception and signal strength. Because the loss-of-reception issue is much more likely to occur in areas where signal is already weak, such a change could result in more reliable overall connectivity. 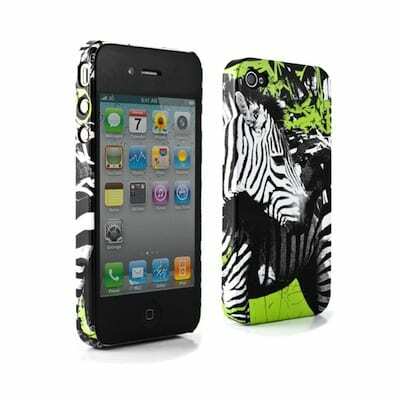 A number of users have experienced an issue in which the iPhone 4 unexpectedly mutes a call, hangs up or engages FaceTime when the device is held up to the ear. 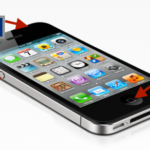 This problem occurs due to apparent under-sensitivity of the iPhone 4’s proximity sensor, which turns off the screen (and touch capabilities) when the phone is held to the ear. In other words, the proximity sensor does not properly engage, and the user’s cheek or ear accidentally touches the mute button or other functions. 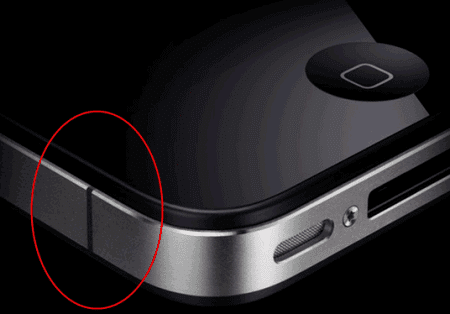 In other cases, it appears that the proximity sensor is not engaging at all, leaving the screen on and touchable while the iPhone 4 is held to the ear. Reset all settings. Although this will not help with an under-sensitive proximity sensor, it may help when the proximity sensor does not engage at all. It appears that the reset may restore a disengaged sensor. Navigate to Settings > General > Reset > Reset All Settings. Note that this will erase stored messages, passwords and other information. Remove case. Some users have reported that removing cases (especially those that were designed for previous iPhones but fit on the new iPhone 4) can mitigate this issue. Launch another app. Albeit kludgy, you can open another app after you’ve made a phone call to obviate this issue. Right after making or receiving a phone call, press the home button then launch an innocuous app (such as the calculator app) that won’t invoke any unwanted functions if accidentally tapped. Although most users have reported faster 3G data throughput from the iPhone 4 relative to the iPhone 3G and iPhone 3GS, some users report dramatically slower speeds in locations where their previous iPhones delivered normal speed. In some cases, the phone displays the message “Could not activate cellular data network” despite full signal (all bars). Apple Discussions poster bgrind1 describes a test in which two iPhone 4 units placed side by side both delivered dismal 3G throughput, while an iPhone 3GS in the same location delivered normal speed. “I just visited an ATT store to ask about this issue. The rep and I tested their two display iPhone4 models and both responded exactly as mine, with little or no 3G data. We simply tried to open yahoo on both display phones as well as mine. All three after 2-3 minutes responded with an error stating no response from server, or something along those lines. Note that this issue is separate from the signal/reception loss issue (see: iPhone 4 Loses Signal [“Death Grip” Antenna Issue]: Why and How to Fix [Scotch Tape]. In this issue, signal and reception remain strong, but data throughput is extremely slow or wildly fluctuates, even though grip is not changed and the phone is in the same location. Reset network settings. On your iPhone, open Settings, then navigate to “General” in the left-hand pane. Scroll down and tap Reset, then select “Reset Network Settings.” This will delete any stored WiFi passwords and other information, but may result in a faster connection. Hard reset. Hold down the sleep/wake and home buttons simultaneously for roughly 15-20 seconds, until the screen powers off then an Apple logo appears, which signifies a reboot. Reseat SIM. Remove your SIM card, clean it lightly using a dry cloth, ensure that there is no debris in the SIM slot, then reinsert the card, ensuring a snug fit. Instructions for doing so can be found in this Apple Knowledge Base article. Switch to EDGE. Albeit a less-than-ideal solution, several users have experienced faster throughput via EDGE than 3G when this issue manifests. Some iPhone 4 users have reported an issue in which the phone suddenly displays a “No SIM Card Installed” error, either while attempting to make phone calls or during routine usage. The most reliable fix for this issue is to simply remove your SIM card, clean it lightly using a dry cloth, ensure that there is no debris in the SIM slot, then reinsert the card, ensuring a snug fit. Instructions for doing so can be found in this Apple Knowledge Base article. Other users have reported that briefly turning on Airplane mode (in Settings) then turning it back off can resolve the problem. 1. No FaceTime option appears in the Settings app. In other words, you do not have the option to turn FaceTime on or off, and no functionality appears in the phone app. Go to Settings > Phone, and you should now see a FaceTime option, which you can turn on. 2. FaceTime button missing from phone calls. 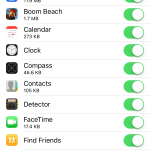 In this case, the FaceTime option exists in Settings, but you cannot initiate FaceTime sessions from the phone app or from the contact screen. You may see a hold button instead of a FaceTime button. Make sure FaceTime is on. Go to Settings > Phone and make sure that FaceTime is turned on. If you don’t see a FaceTime option, follow the procedures above. Reset all settings. Navigate to Settings > General > Reset > Reset All Settings. This will erase stored messages, passwords and other information, but may resolve this problem. Failing the above, restore your iPhone 4 as a new phone as described above. 3. FaceTime doesn’t work on some Wi-Fi networks due to firewall restrictions. We noted a fix for this issue here, which Apple subsequently noted in a knowledge base document. Try forced restarting your iPhone by pressing both the Home and Power button until you see the Apple Logo on-screen, then release those buttons. If you continue to experience this problem (we call it boot loops), then connect the iPhone 4 to iTunes and try updating the iOS from there or restoring. My iphone4 got wet and is dead. What can I do to restore it? If it got wet, thoroughly let it dry before you use it. Take out the SIM card and any other removable parts then rub it dry with a microfiber cloth and gently shake it to get the water out from the ports etc. If you have a desiccant like those silica gel packets that come with certain electronics and other things, surround your iPhone with those–they pull out water. If you don’t have any of these on-hand, check your local arts and craft shop or office supply store. Let your phone dry out with a desiccant for at least 48 hours. Then try turning it on. If it still doesn’t work, it’s likely the phone is damaged to the point beyond repair. A replacement is the best solution at that point. I have a problem in my I phone model A-1387( Flash light continue in on mode. How can I off the flash light? ?Please help. First, just try taking a photo using the flash and see if it goes off after that photo. Try resetting all your phone’s settings. Go to Settings > General > Reset > Reset All Settings. This resets to default everything in Settings, including notifications, alerts, brightness, and clock settings like wake up alarms, reverting all your personalized and customized features like wallpapers to factory defaults. Sorry to hear about your friend’s situation! That must feel very frustrating for him and you. It sounds like your friend is running into problems with Apple and Whatsapp not really supporting older iPhones like the iPhone 4. Technically, Whatsapp supports iPhones with iOS 7 or later. However, the App Store only offers WhatsApp that supports iOS 8.1 and later. According to the Whatsapp support site, for the following operating systems, you can no longer create new accounts. However, you’ll be able to continue using WhatsApp on: iOS 7 and older until February 1, 2020 Because we’ll no longer actively develop for these operating systems, some features might stop functioning at any time. So that makes things very difficult indeed! If he has the older version of the app that still supports iPhone 4–then it might be tied to the previous owner’s phone number and SIM card. Some folks tell us that changing to a new SIM card solved their problems. But we can’t verify that solution. I suggest you contact Whatsapp support and see if they can solve the problem for you. Sorry we can’t be of more assistance to you and your friend. I hope you both get this problem solved soon. Looking for help. My old an trusted IPhone4 I playing up. When I go to settings and go to the apps using data page and turn off all the apps that I don’t need to be turned on when I leave they are turning themselves back on again. If you’re still unable to make calls, contact your cell phone carrier for further instructions. I have a I phone 4. I cannot retrieve messages. This just started yesterday, always in past worked fine. I hope you can help as I use this for work messages. Sorry, your iPhone is unable to retrieve messages. Let’s try to reset your network settings–go to Settings > General > Reset > Reset Network Settings. This action removes any stored WiFi passwords, so make sure you have those available to enter in again before you reset your network’s settings. Then, close the Message App by double pressing the Home button and swiping up on the app’s preview. Once the Message App is closed. Restart your iPhone. Then try opening the message app again. Sometimes the WIFI works but most of the time is not even after a restart. My mother board is faulty from the factory. Product recall is in order is the right thing to do for apple. All the sudden my iPhone 4 doesn’t alert me when I get a text message. Can someone help me? My iPhone is not ringing when anyone calls, ringtone is set in settings, volume is at maximum, mute is off, can someone pls help me ? 1. Make sure that the “Cellular Data” is turned on. If this switched to off, it could be a problem. 2. If the steps above do not work, try resetting the password for your visual voicemail. That should do the trick. How do I make it available? can anyone help me with my iphone problem. about 2 month ago my iPhone 4S had begun to malfunction, at first i couldn’t hear people when i called them but they could hear me, i thought it was the ear speaker problem so i replaced it. Then after replacing it i tried to pay my phone service (which had expired after i replaced the ear speaker) but when i typed in and dialled, it would call and automatically hang up so calling my phone service was impossible, then one day out of the blue my iPhone completely died, it wouldn’t charge or turn on i had even tried to reset it but my computer would no longer recognize my phone i pressed on/off and home button while it was connected to my laptop but still nothing i have attempted to charge it several times now and nothing i even spent money and replaced the battery, the earphone jack cable, and the screen in hopes that it would fix the problem but i still get nothing, it has been 2 months and I’m at my last leg, i have visited multiple websites for an answer but no one can seem to help me, and i can no longer continue to waste senseless money on something that won’t work, and i don’t want to buy another phone either, I’m here in hopes that someone will give me an answer on how to fix this. Or at least confirm that my motherboard has died out. Which i hope is not the case. i have a iphone 4s when i plug it into charge the apple symbol just repeatedly comes on and off and thats all it does…..can anyone help fix this plz?? On mt iPhone 4, I can not get my “slide to unlock” to slide. What??? im experiencing a serious issue with my iphone 4 it has a message that has been popping up every 3 seconds for the last day ive tried rebooting and resetting settings. the message is asking me to fill in my apple ID to sign into either facetime, icloud, or imessage. ive tried rebooting and resetting my settings but even if i put in the code it wont stop popping up. has anyone else experieced this problem if so, HELP!!! i have iphone 4s & ireceived a message for software update. so i proceedfor that. my iphone 4sgot hanged it shows only one message”connect to itunes.” when i connect to itunes the site does not give me permission to enter it.give me a way. My iPhone 4 keeps switching my contact pictures around in my phone book. Every few days they will switch again. Can’t verify the mail for Apple ID setting,why is that ? Hi, for no apparent reason my iPhone 4S out of the blue won’t accept my 4 digit password. I haven’t changed the password and each time I repeat it, it locks me out and will only allow emergency calls. Not sure what to do. Have tried turning off etc but to no avail. Sound has gone from my iphone4 it does ring but that’s all now I’m having network error have gone into settings and all is ok!????? im having problems with my iphone 4. its completely blank, but when i put it on charge at the mains it says connect to itunes. but when i do so nothing happs and my computer doesnt even recognise the devise. can anyone help? My Iphone 4s has recently changed display colors. It is all black and brown display and all pictures are basically whited out. You can see the figures in the pictures, but that is it, they all appear white. What can I do to fix this issue? My iPhone 4 keeps crashing,even during calls. Have done everything suggested in terms of closing down apps and re booting. Was suggested that I up grade with iOS 5. Have done that and enjoyed the benefits in between the phone crashing still. Just out of warranty . Very fustrated with it ! My iphone4 is totally not working. It’s suddenly shut out by itself without me turning off in the main switch. when i tried to turn on the main switch it’s not working nor open itself..
my iphone 4s has also shut down on its own and will not restart or even take a charge. Does anyone have a fix for this? When I open a thread of texts between myself and another person then try to edit the contents, the “delete” and “forward” buttons at the bottom are greyed out, hence do not respond. Help! My iPhone 4 accidentally hit my car. Top of front glass cover cracked. Can it be replaced? Is it under warranty? Can phone still be used? i brought a new 4g phone in uk 2 weeks ago it was fine in its first week and than my camera is not working at all i have tried every thing possible from rebooting to reset factory settings. is their any one who can help me in this? Power adaptor was bernt when newly purchased iphone 4 was pluged to recharge. Thereafter, iphone does not power on. When it is connected to the computer the sreen just illuminate nothing displaying for few second and off. This repeat in about 10 second intervals. Your advice is highly appreciated to rectify the fault. I am having a problem with the texting app. Sometimes the send button doesn’t activate so that I can not send the text that I just typed. Nothing I can do at all. Some times it does. Other times, I send a pic via text and it goes through to the recipient but it tells me that it didn’t. I resend only to find out that the first and second attempts were successful. My phone tells me that neither were. my iphone has experienced ALL of these problems. and now the screen has zoomed in and won’t zoom out, so i can’t even get to the reset option. i’ve always held apple products in the highest regards, but i hate this phone. i’d rather have my 4 year old razr and am working on an apology letter to t-mobile for switching to at&t. I still have over two weeks to return the phone so I am into a hard evaluation period. So far this is a $200.00 toy and not a phone. I need it to be phone first and foremost and a toy second. Why is it a bad phone? Simple, reception or lack there of. The combination of I-Phone and AT&T is a lethal combination for product satisfaction. I certainly do not need the CEO (Steve Jobs) telling me that first there is no problem then hold it like this and not like this and here have a glorified rubber band you will need to use. Needless to say this whole experience is not going well. Apple needs to do some hard and fast repairs and/or replacements or face world wide reprisal through refunds and thought the courts. At this point I may be spending my two year contract with Sprints HTC EVO 4G. Now can someone jailbreak the EVO? And Steve you need to get into bed with Flash also. Come on lets get with the program. You realize of course that this list is an abomination. Hokey reboot advice, USE a case. DONT use a case. Turn off 3G. The proximity sensor is only sensitive to 1/4 inch where prev iphone it was sensitive to 1/2 inch. None of these suggestions is going to really work. This is fiddle advice. Apple needs to fix this phone. Disabling 3g worked for me. I wasn’t even able to accept or receive calls from certain phones until I disabled it. It was very spotty. Is everyone really accepting the flaws in this phone because it’s Apple. I’ve never owned a phone where you would have to make so many concessions in order for it to work correctly. Hopefully they can get a fix in soon. It would be a shame to have to send it back. Other than the phone connection problems, it really is a nice device. Iâ��m looking at an iPhone 4 upgrade here pretty soon. My Blackberry died about two weeks ago and Iâ��ve been stuck with a Rockr. It happened just long enough after the preorders that I have to wait to get one now. Doh!